The Philippines is ranked 139th out of 180 on the Corruption Perceptions Index, registering a 2.3 out of 10 (with 10 being the best). In 2007, it was the second-worst in East Asia, a few points behind the Indonesia. My friends in the Philippines used to joke that the only reason it didn’t have the lowest score is because it paid off the judges. But, in 2008, it re-claimed the top spot, back on top after Indonesia climbed its way up. Corruption is a major problem in a lot of countries, endemic in all sectors. But the one that is perhaps the most troubling is the education sector. The education sector is often one of the top two or three leading sectors in terms of government funding. Unfortunately, in many countries corruption is endemic within education, and the countries are some of the worst (with the exception of Ghana, which I explain below). In the Philippines, according to my old co-workers, the ministry of education is the rifest with graft. (To learn more about education in the Philippines, read a post I wrote from 2009). What's yellow and orange, and red all over? 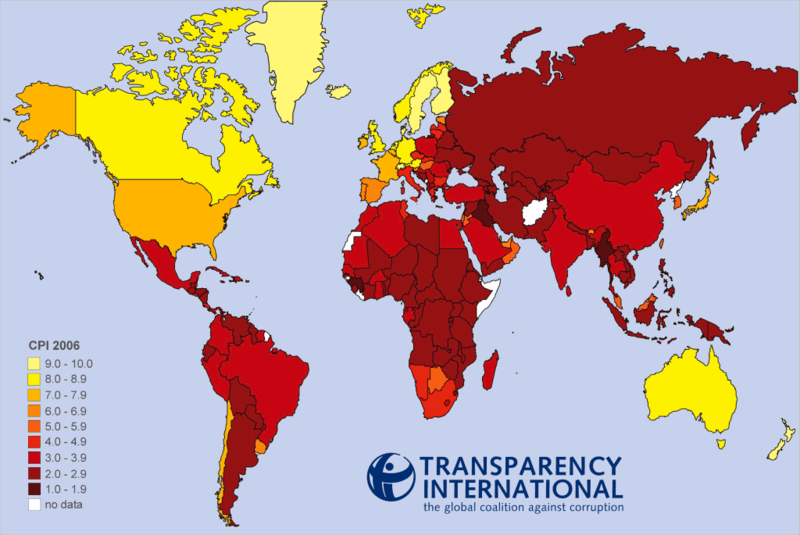 The 2010 Corruption Perceptions Index map from Transparency International. Kenya is another country that is no stranger to corruption. It has the dubious distinction of being ranked 154th out of 178 countries (or the bottom 10% percentile). According the country’s anti-corruption commission, Kenya loses 40% of its gross domestic product to corruption every year. Today in the Daily Nation, the leading Kenyan newspaper, a front-page article, titled “How free education billions were stolen,” details how more than 100 government officials, including top civil servants, deposited money meant for schoolbooks and teacher salaries into fake bank accounts, only to later withdraw the money and steal the money. Sub-standard educational material purchased due to manufacturers’ bribes, instructors’ copyrights, etc. ‘Ghost teachers’ – salaries drawn for staff who are no longer (or never were) employed for various reasons (including having passed away). This affects de facto student-teacher ratios, and prevents unemployed teachers from taking vacant positions. There are other ways to steal that are not mentioned in this list. Some of these examples are at the individual school level; others at the national level. But these forms of corruption do not exist in a vacuum and must be examined in tandem, as corruption at each level of the bureaucracy influences corruption at other levels. The less money a school receives from the Ministry of Education, the more its teachers and administrators must be entrepreneurial, so to speak, to make up for the deficit. Leakage throughout the system creates mistrust and anger among parents, who have to scrape together money for school fees that shouldn’t exist in the first place. And, at the end of it all, ones on the losing end of it all are the students, who receive a sub-par education, if they are lucky enough to afford one at all. Ghana is an interesting one, however. When I speak with other Africans, be it from Nigeria, Kenya, Zimbabwe, or another country, they all have much respect for Ghana and the government it has created. In 2010, Ghana scored 4.1 on the CPI, or 68th out of 178. It has had a track record of successful democratic elections for the last twenty years or so, after Jerry Rawlings, a former fighter pilot for the Ghanaian military, took control by force in a coup in 1979, ruled the country as a military dictator until 1992, and because the first (and second) democratically-elected leader of the republic he created, stepping down willingly in 2000. His party, the NDC, lost in a free and fair election, turning the reigns over to the MPP until 2008, when the NDC reclaimed the thrown, again in a free and fair election. It is unclear if the success of Ghana’s democracy is the reason for its high level of economic development, or vice versa, but it is certain that these two factors have given the people a voice that can express its frustrations with corruption loudly and openly. It is no surprise that the country ranks so high on the Corruption Perception Index.